Growing your list should be a top priority, but how do you go about doing that when you’re squarely focused on guest posting on other people’s blogs? Today I’ll show you how you can carry on guest posting and build your list at the same time. Which blogs should you approach? Before we get into the details of list building, it’s important to look at the type of blogs you should be approaching, and where to look for them. You want to build your influence – to position yourself as an expert in your niche, so it makes sense to approach those blogs that already have weight and influence in your chosen area of expertise. Sure, you could guest post on blogs that are at the same level of growth as yours, but you won’t see the results you’re after. Remember, influential blogs already have an established following that you can tap into. This is vital when building your list. Head over to a site like Alltop and browse topics that are related to the type of content you publish. Browse the blogs in each of the topics and pick out the ones with a substantial following and influence. Thoroughly check out their blog (chances are you already read it so are familiar with it) and then find out what their guest posting procedure is. Most blogs have a dedicated page with details about guest posting. If you can’t find that info however, a quick, polite email inquiring will get you what you need. For specifics on how to craft an awesome pitch, checkout Adam’s post on blogger outreach tips. Once you’ve landed a guest posting opportunity, the next thing you’ll need to tackle is coming up with content that will knock the socks off your audience. Chances are you’ll be given an idea from the owner of your chosen blog. You’re not only writing to the blog’s audience, you’re writing to your potential future audience. What do they want to read about? Your aim is to get people to sign up to your list, so your content needs to be actionable and valuable to get people to click! So for now, forget your niche. Grab a sheet of paper and start brainstorming, Look for ways your own audience and the audience of your chosen blog can over-lap. It might be that you have to open your mind to branching out from your area of expertise. It gives you scope to reach a wider audience, providing you’re writing to them on topics they want to hear about. So do your research and give them the value they want. You’ve landed your guest posting opportunity, you’ve come up with a knock-out topic that you know the readers are going to love. Now, it’s time to get people signing up to your list and it’s going to involve your author bio or byline. In nearly all guest blogging cases, you’ll get a byline at the end of your post that will link out to a destination of your choosing – usually your own blog. Where most bloggers make a huge mistake is by using that valuable backlink to link to their blog homepage. Don’t make this mistake! You want to build your list, which is much more valuable in the long-run than gaining a few extra visitors to your homepage. Instead, choose to link your bio to a landing page that has a sign-up form for your email list. Invite people to sign-up before they even reach your own content with a direct call to action. They’re coming straight from your guest post, to a proposition. 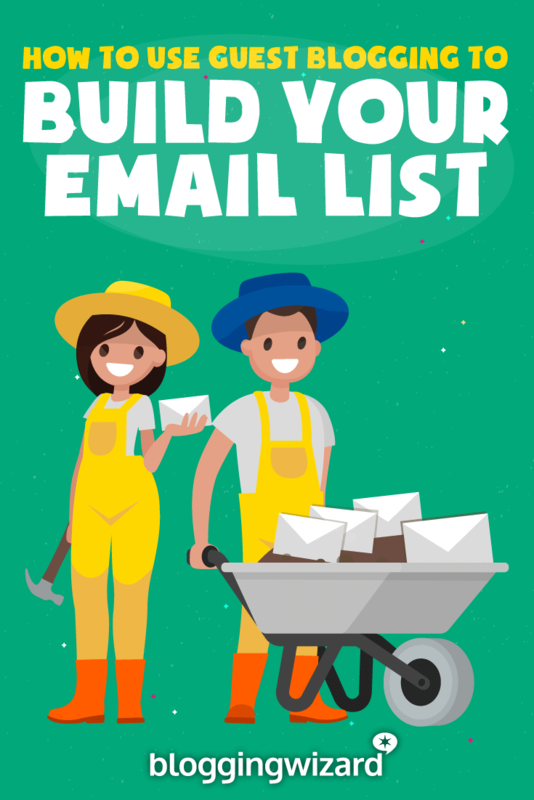 Chances are they did enjoy reading your post since they clicked through, so they’re doubly likely to sign up to your mailing list when instantly faced with it. About the author: Adam Connell is the Founder of Blogging Wizard, a blog focused on helping bloggers to increase their traffic and email subscribers. If you want to blog smarter and not harder, download his free guide and learn how you can leverage the influencers of others to boost your traffic and authority. Alternatively, many blog themes have built-in landing page templates you can utilize for this purpose. Adam also has a list of landing page plugins you can check out. And Colin has a comparison between Leadpages and Instapage. Last of all, don’t abandon your guest post once it’s been published. You want to nurture relationships with your readers and show them that you value the fact they’ve taken the time to read and comment. Check back in on your post a couple times per day to respond to comments and feedback. Not only does this take some pressure away from the host blogger, it shows your audience that you’re invested in them. You care about them and what they have to say. In turn, it will make them much more likely to check you out and ultimately, sign up to your list. There are multiple ways you can build your list through guest posting. All it takes is a little planning to get the results you want. I’d also recommend checking out Adam’s post on guest blogging strategy. You’ll learn 11 tips to give your guest posts the edge. Sue Anne Dunlevie runs SuccessfulBlogging.com, where she helps beginning bloggers grow their lifestyle-friendly businesses.